Seamlessly monitor, alert, and report on all file accesses and modifications made to your file server environment. Security starts with knowing who sees what. Get a snapshot of recent user activity, file activity, and access trends. Know the essential four Ws for every access: Who accessed what, when, and from where. Focus on events that matter most, such as sudden permission changes, file deletions, and renaming events. Identify the most active users, most accessed files, and most modified files within your file server. More on auditing file and folder access. Trigger instant alerts whenever there's sudden spikes in file or folder access or modification events. Get real-time notifications whenever there's multiple failed access attempts to critical files. Monitor changes made to sensitive files after business hours. Selectively monitor critical files, folders, shares, and user activities. More on file integrity monitoring. Receive real-time file change alerts. 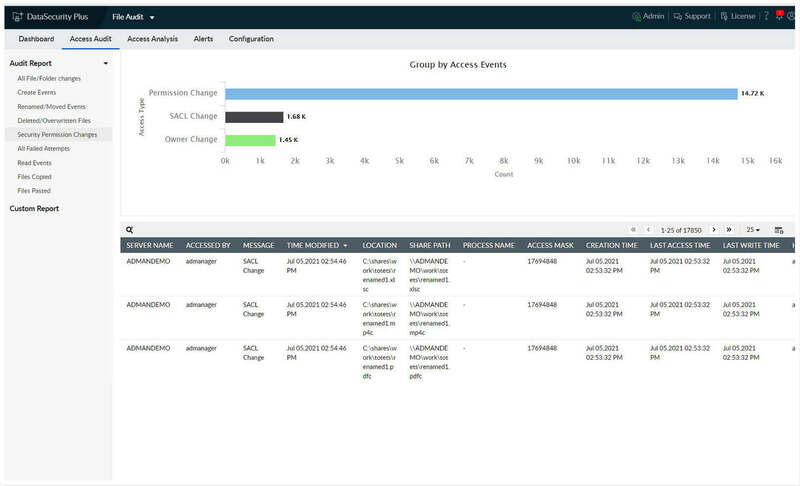 Get real-time alerts whenever unauthorized modifications are made to critical files. Spot privilege misuse and unusual activity by configuring threshold-based alerts to monitor user-generated events. Track source, host details, and more as part of forensic analysis. Check when a file was last updated to flag unusual accesses after extended periods of inactivity. More on real-time file change monitoring. Spot indicators of ransomware attacks using threshold-based, real-time alert profiles. Detect ransomware attacks faster with an automatically updated library of ransomware file types. Shut down ransomware-infected systems using preconfigured and custom scripts. 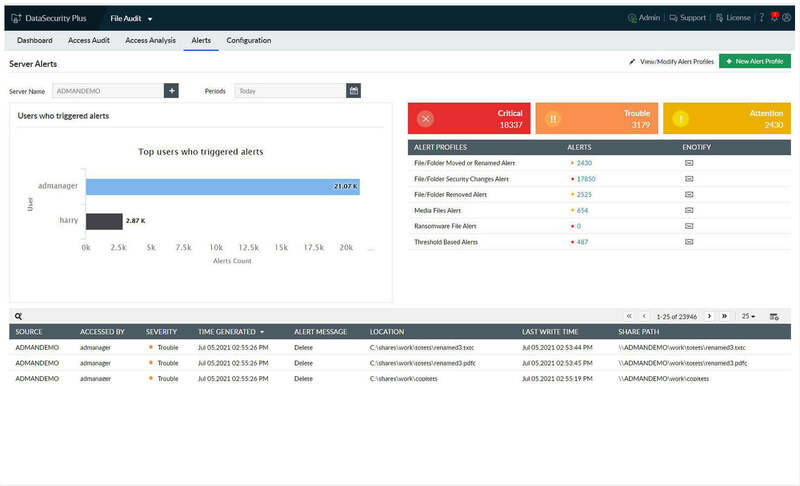 Track client IP and host details to perform post-incident root cause analysis. Address critical requirements of PCI DSS and HIPAA regulations using change detection. Identify the root cause of security incidents using accurate forensic data, and generate clear and concise audit records. 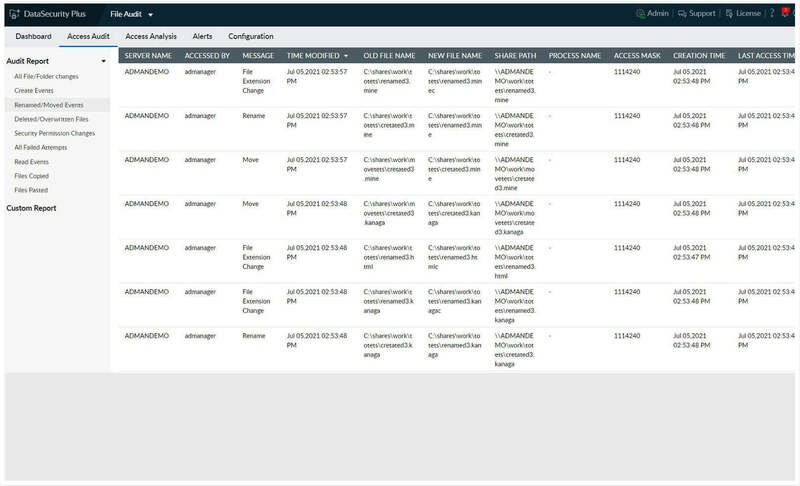 Generate and archive audit trails to ensure accountability for all file activity. More on meeting regulatory mandates. Everything you need for data visibility. modification made by users within your file server environment. Use the one-stop operational dashboard for a quick overview of recent file and folder access types. Use custom filters to analyze and investigate any sudden changes in access trends. 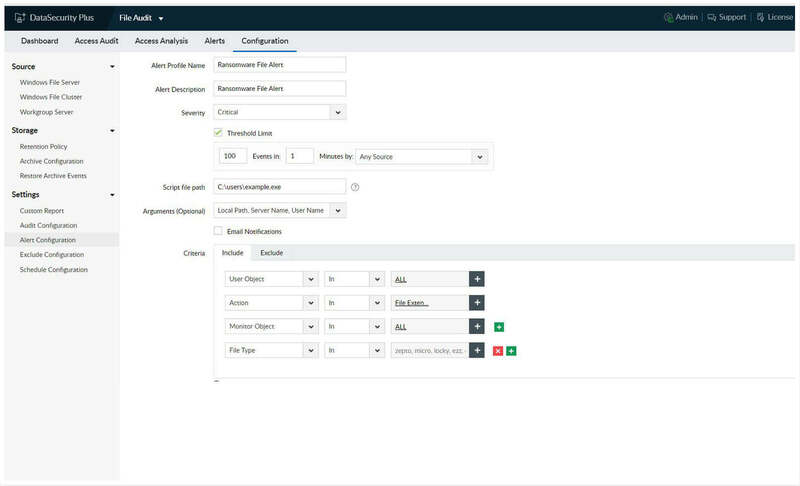 Selectively filter and monitor high-risk access types, such as file extension changes, renaming, deletions, permission changes, and file activities made during non-business hours. Stay on top of changes that might be accidental, including file deletions, moves, and permission changes. Track and reverse file name changes—both intentional and unintentional—by comparing original and altered file names. Choose your area of focus. 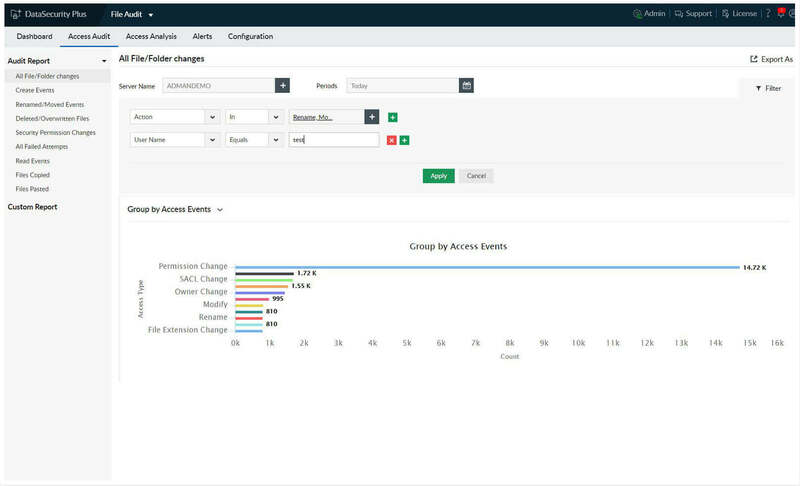 Generate alerts selectively by focusing on suspicious users or critical actions such as owner changes, permission changes, file deletions, or renaming events. Analyze events based on their severity and obtain detailed reports for each event. Track malware in real time. Speed up your incident detection with instant email notifications for malware attacks, especially ransomware, by detecting sudden spikes in file renaming and modification events. Stop a ransomware infection within seconds by promptly shutting down an infected machine. Execute custom scripts to perform actions tailored to your organization's needs (e.g. disconnect the user session or lock the user account). Know your data, at a glance. One-stop operational dashboard for a quick overview of any recently discovered PII (including volume and type), identified personal data trends, and more. Easy-to-understand reports on instances of personal data, including their type, location, and the amount of personal data stored in each file. Knowing where, how, and why PII/ePHI is stored helps not just with GDPR, but also with other compliance standards like HIPAA and PCI DSS. Get a complete list of DataSecurity Plus' features and functionalities sent to your mailbox. Identify where your sensitive data is.